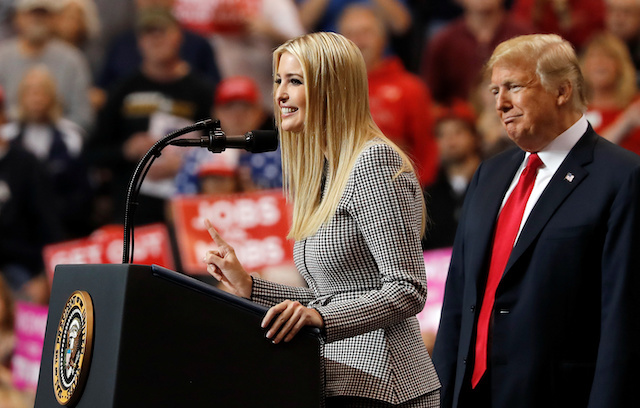 Presidential counselor and first daughter Ivanka Trump used her personal email hundreds of times to conduct some government business and schedule meetings in the early months of the administration, The Washington Post revealed Monday evening. Ivanka turned over her private emails to the White House counsel’s office after ethics officers noticed the private email use. The emails were reviewed by her attorney who noted in a lengthy statement that she did not understand the rules governing private email use during the beginning of her tenure in the administration. “While transitioning into government, after she was given an official account but until the White House provided her the same guidance they had given others who started before she did, Ms. Trump sometimes used her personal account, almost always for logistics and scheduling concerning her family,” her lawyer said. Ivanka’s representatives also pointed out that on several occasions Ivanka was contacted first by U.S. government representatives on her private email, prompting her to reply. Her use of a private email to conduct some government business was immediately seized upon by Democratic lawmakers who noted President Donald Trump’s frequent criticism of Hillary Clinton’s private email use during the 2016 presidential campaign. Ivanka’s use of a private email to conduct some government business was first reported in September 2017 by The New York Times’ Matt Apuzo and Maggie Haberman. Haberman pointed out that the story today revolves around the scope of Ivanka’s private email use. Other officials reported to have used private email in the early months of the administration included Steve Bannon, Gary Cohn, Stephen Miller, Jared Kushner, and Reince Priebus. Private email use is prohibited for official U.S. government actions because they are not able to be preserved for record-keeping and ethics purposes. Private emails can be used by U.S. government officials but they must be forwarded to their work emails in order to keep a digital record of the action. Blake also noted that Clinton’s possible jeopardization of national security information on her private email server was at the center of the criminal and ethical investigation against her.